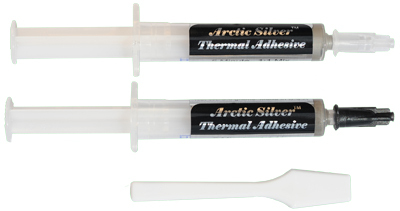 Arctic Silver Thermal Adhesive is a two part permanent adhesive for thermal joints in minimum bond line applications. It is NOT intended to be used between a CPU and the CPU heatsink. On a CPU please use a thermal compound such as Arctic Silver 5, Céramique 2, or Arctic Alumina. For proper use refer to the instructions here. Made with 99.8% pure micronized silver. 62% to 65% silver content by weight. Superior thermal performance. A and B) and a plastic reusable mixing wand. Arctic Silve Thermal Adhesive should be kept cold and away from UV light (sunlight and florescent lighting). We recommend refrigerating the unused material and allowing it to come to room temperature prior to use. © 2016 Arctic Silver, Inc. All Rights Reserved. All trademarks used in this site are the property of their owners.